The summer is my favorite time of the year, and what better to do than to make a bucket list to get the most out of my summer?!? This summer’s list seems longer than ones from past years. I packed this summer full of activities, hoping that it would make my last summer at home the most memorable one yet. I’m also hoping that keeping busy will make the summer fly because I am eager to get to the grand finale–the big move to Texas! It’s been proven that people who keep a list of their goals are much more likely to achieve the goals they have than those who do not write them. 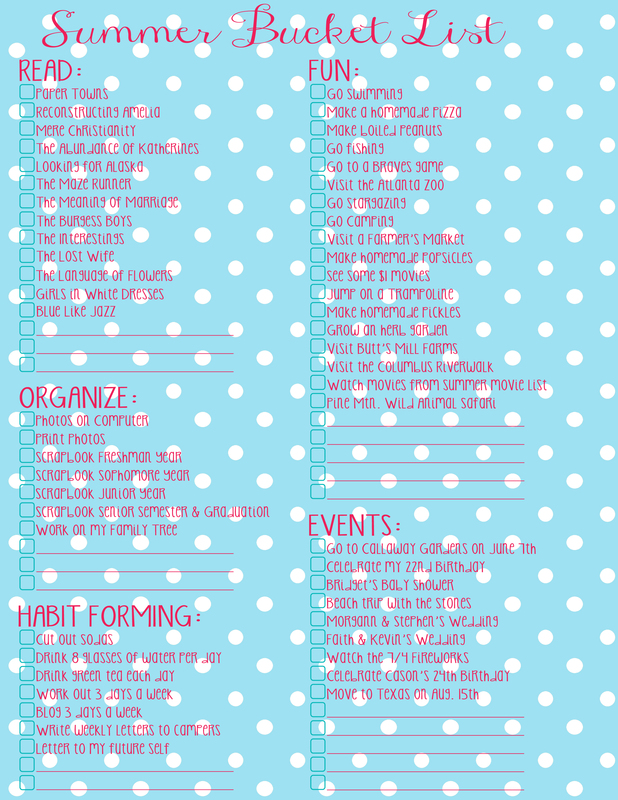 So, I always like to include goals for organizing my life and forming more healthy habits. In the past it has been easier for me to develop certain habits over the summer and work towards maintaining them in the fall. I actually prefer summer goals over new year’s resolutions, as I have had much more success with summer goals in the past. So if you haven’t tried a summer bucket/goals list before, I encourage you to try it and let me know how it goes! I’d love to hear what you have planned for the summer. Feel free to post your summer events in the comments box below! Happy Summer!